CNG: Printed Auction CNG 75. BOEOTIA, Thebes. Circa 395-338 BC. Æ 12mm (1.85 g, 10h). Aris-, magistrate. Struck circa 363-338 BC. Sale: CNG 75, Lot: 268. Estimate $100. BOEOTIA, Thebes. Circa 395-338 BC. Æ 12mm (1.85 g, 10h). Aris-, magistrate. 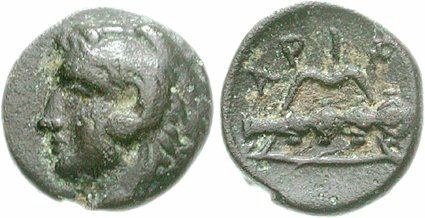 Struck circa 363-338 BC. Youthful head of Herakles left, wearing lion skin headdress / Club right over bow upwards; ARIS above. BCD Boiotia 564b. VF, black patina.